Knowing features that you want is a huge first step to being able to move forward to finally purchase the ‘perfect’ RV. Not different from any home is the fact that compromises must be made. We’ve vacationed and owned our Class C, we’re knowledgeable, right? Wrong. The list of what we don’t know remains much longer than what we think we do know! There just isn’t enough time to become an expert in the value, mechanics and myriad of other subjects inherent with the upcoming full-time lifestyle. So, forge ahead, iPad Air in hand, wifi available to quickly look up what we can as we go! There were a few models that fit most of our written requirements (see Purchasing ), only one of which was in Colorado Springs, naturally. One call to the seller and it proved to not to be ‘the one’ (not enough horsepower, although owner swore the 360 hp was enough to tow and get around CO passes, we weren’t convinced and stuck to our 400 minimum plan). Further emails and calls gave us choices in Texas and Arizona. It can get expensive and time-consuming to travel, so choosing carefully by asking for as much information beforehand is in your best interest. If someone isn’t willing to take the time to answer you, they have probably saved you a lot of time, as there is likely something wrong with the unit! We narrowed it down to the Scottsdale, AZ. Class A Diesel 2008 Gulfstream Tourmaster, 425 hp Cummins engine, three previous owners, no smokers and no pets, with 40K miles, (a little higher than anticipated but they were diesel miles and hey, remember compromise) convinced this was the unit for us. Before we booked a trip, we wanted to have an experienced inspector go over the RV (choices to be made: should we be there for the inspector or save $$ in case it isn’t a sound RV and how do we choose an inspector). Decision made, inspector first. (Brian is still working full-time and time off right now can be precious) Back to the internet for options and reviews. We wanted a completely unbiased inspection and therefore didn’t ask the RV dealer for any suggestions. Don’t believe everything you read on the internet, right? The ad boasted auto, RV and boat inspections. It turned out that perhaps Mark’s expertise was in autos and he had been in an RV a few times in his life. That is probably an exaggeration, but he learned a good lesson about not letting your personal feelings about people (the dealership found his lackadaisical approach to appointment setting and actually showing up rather unnerving, as did we) stand in the way of a professional assessment. After a few days of quibbling with him, we were at least sure the unit was sound enough to make the trip. I would not recommend Mark Allen of Auto Detectives in the Phoenix area for a pre-purchase RV inspection. Perhaps had I asked him the number of RV’s he has inspected and when the last time he inspected one, I would have saved us a lot of trouble and moved on from there. Lesson Learned. Armed with excitement, liquidated funds and anticipation of our future, we booked our ticket (one way) to Phoenix, with a confidence the (anxious) dealer will have someone pick us up at 10AM in front of our hotel. A beautiful morning, we wait, outside, in the magnificent Arizona sun. It’s getting hotter and lots of people are coming and going, but not us. Okay, they forgot. One call and they will send someone right away. Shades of things to come… After the (term used loosely) driver got lost, yes, I said got lost, we ended up driving through a park that advertised the Dale Chihuly exhibit at the Desert Botanic Gardens. I stashed that possibility away should we have time while we were there. Little did we know that we would have all the time in the world, as the RV was not even close to being ready, as expected, when we were dropped off at Scottsdale RV. What a busy little place and I mean little, family owned and operated, Scottsdale RV was friendly but very short-handed. All hands were on deck and they couldn’t keep up with the demand that seemed to overflow their lot. We saw 3 different RV’s sold during our few days experience with them. Had we not seen it for ourselves, it surely would seem a line that there is ‘another party interested’. They are honest, down to earth but very much over their heads in expanding their business, during the busy season. Maybe not the best of business plans, but we wish them much success, even though they managed to stretch our patience beyond our limits. It reminded us that our new lifestyle was to be one where we didn’t have to worry about time, wasting it, and leaving ourselves open to flexibility and adventure. Did I mention that Brian is still working and we were taking a long weekend to presumably pick up RV and drive it back to Colorado? 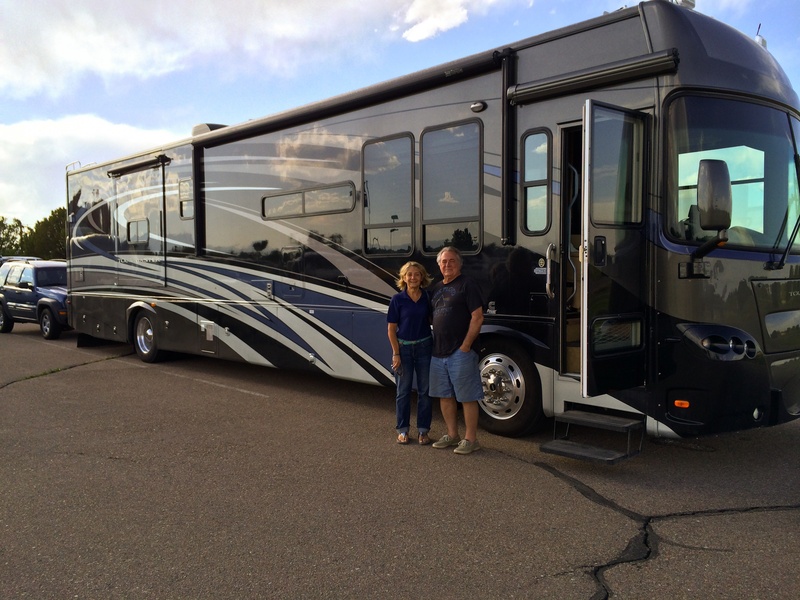 In fairness, Ryan Beckman, owner of Scottsdale RV did his best to make everything right. Negotiating with him, following our extensive run-through with Keith, his main mechanic/salesperson/driver (getting the picture of everyone doing whatever it takes to get through the day) was a breeze; we left with a promise that all would be fixed, detailed and ready to go the next morning. The inspection was fairly spot-on, at least the few things he mentioned as being worn, so we were prepared for what we saw. I always think having your expectations in check, or having no expectations at all, helps to provide a more honest assessment. There is nothing positive about being let down so I avoid it at all costs. The leveling jack brakes were revealed by the previous owner to be in need of fixing and while adjusting the new installation, the mechanic broke a pin. Hence, the RV was not ready to leave the lot. Ryan put us up in a local Scottsdale hotel and gave us a truck to use (the Chihuly glass exhibit– same artist who has the Las Vegas Bellagio lobby ceiling exhibit was an amazing addition to our sudden and unexpected weekend vacation; as was the spontaneous visit to Chandler for an overdue visit to cousins we were secretly thrilled to see). The next day when it became obvious a new part was needed; Ryan dashed our vision of a wonderful maiden trip to get to know our new home, flew us back to Colorado and said the RV would be delivered to us, at his expense. Although frustrating, this turned out to be the way to go, as learning to drive a 42.5’ RV (almost as large as you can get without requiring a CDL license) is an adventure worthy of another post, soon! Two weeks later, our RV was delivered safely to us via Robert, another of their sparse workforce, driver/mechanic/salesperson. Two minor parts (ladder extension and an interior door lock) were going to be shipped to us in the (hopefully) near future. Lessons Learned? No matter how extensive you study, experience is probably the only thing that will take you through to success for purchasing such a complicated and extensive rig. You will overlook something. Things will go wrong no matter how thorough you are. Remaining flexible and budgeting your time accordingly is paramount to making it all work. Murphy’s Law, that if there is something to go wrong, it probably will, is not a comforting thought. Gaining the experience to deal with it is our goal as we embark on THE CARLIN ODYSSEY! We have our vision of what will make us comfortable on the road, at least we think we do. Not knowing if we were going to find it, we started an early (internet) search (not counting the last 37 years of imagining, RV Shows, being invited ‘aboard’ and magazines, etc). Our most distinct (for searching purposes) features were Class A, Diesel, >/= 400 hp, $100-$150K, Bath and Half. We did find that after 2007 (we don’t want anything older than that) all manufacturers made at least one model with an extra half bath. Many react as this last feature being overkill, but for us that is a personal comfort neither of us is willing to forgo if we don’t have to. Enough said, it’s a medical, age, creature comfort thing. There are many more ‘want to’ haves, not necessarily deal breakers on their own merit, although we think we can have it all, so that is what we are going for! How to create a balance between realistic day-to-day full-time living in a reduced interior space, while not trying to replicate all we have; reduce our footprint, so to speak. We have inquired about above layout and are prepared to travel to Scottsdale, AZ. If not, there is North Carolina, Florida, California and on and on, a plethora of inventory, it helps to narrow it down before you start shopping in earnest. I have a fairly busy (RV lifestyle change) list this week, finally! Spring or not, the Carlin Odyssey snowball is forming.